Schoolhouse Gap Trail, Bring the Kiddies! When you hike Schoolhouse Gap Trail probably the first thing you'll wonder is, "Is there a school on this trail?" The answer is "nope." So, why is it called Schoolhouse Gap? 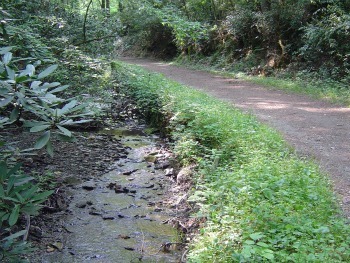 Most likely this trail was used by kids going to school back before the Great Smoky Mountains National Park was established. What you will find on this trail are wildflowers and a stream running along it. The kids will enjoy looking for wildflowers or taking a dip in the stream. The trail is a wide, gravel road so there's plenty of room if you're hiking with a group. It's 2.1 miles one-way, but you can hike as far as you want or until the kids get tired:) If you reach the end, you can take Chestnut Top Trail on the right. Chestnut Top is a great wildflower trail and there are some nice views too. Approximate Elevation: Starts at 1600' at Laurel Creek Rd. The trail peaks at 2100' then descends to 2000' at Scott Mountain junction. How to get to the trail: From the Townsend, TN entrance, take a right on Laurel Creek Rd. The trailhead for Schoolhouse Gap will be off Laurel Creek Rd., which is on your right.